Exhibition stands offer fantastic opportunities to interact with current and potential clients, and equally for them to interact with you. It is important to present a good company image with the way you layout your area at your event, display or exhibition. Plex understands the importance of quality products to promote your business at a price that is affordable to you. Here are some ideas for your next event, exhibition or display. By using a pop up stand you can create an open yet clearly defined space for your customers and potential customers, using clever graphics to attract their attention. The Plex Advantage fulfils all your requirements for a pop up stand and offers everything that you need, available in a choice of sizes 3×2, 3×3 and 3×4 and the added option of a curved or straight system, all at the eye catching height of 2130mm. 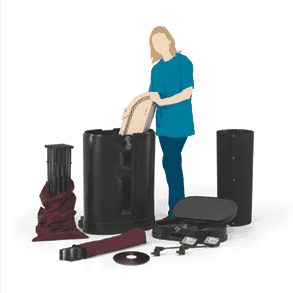 The unit comes with 2x 150 watt flood lights, a durable wheeled case complete with a beech folding top and fabric wrap (to easily convert the case into a lectern), hanging kits, magnetic bars and mag tape. A fantastic ready to use product that just needs graphics adding. 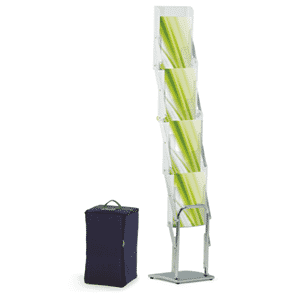 To further accentuate your display why not accessorise with these other essential products? A great way to reach your target audience could be through the use of digital surveys; this allows you to research your customers, perhaps for responses to a product, service or an offer. Through the use of an iPad you can gather information, collect data from your target audience for future campaigns amongst a host of other valuable information. To do this what better way is there to present the iPad than with the Plex iPad holder, available as a floor standing model or a desktop model. Presenting to your key audience at your exhibition or display and informing them of products and services offered is vital to success in any business. With this in mind, it is important to place literature, pamphlets and brochures in a way where they are easily accessible and readily seen by your target audience. With the Plex Media 4 Deluxe literature stand you can be sure to get maximum impact, yet without detracting from anything else. Stylish and yet very understated, the system is strong and durable, with a sleek chrome base, and four A4 pockets. The system is also collapsible and comes with a padded bag, making it the perfect accessory to use in any event and exhibition.